I’m not a very artsy-craftsy person. In fact, once when I was a teenager, I was trying to make a basket that looked like a bunny rabbit. When I handed it to the recipient she exclaimed, “Oh what a cute kitten!” Whenever I attempt to make Snowman Pancakes, they look like blobs with a chocolate chip face. It was a miraculous feat when I pulled off making a piñata in the shape of a Lego with a shoe box, eight bottle lids, and sheets of tissue paper. Are you up for a service challenge? While I’m a far better cook that I am a craft creator, I do really enjoy putting together simple projects – especially if it means I can bless someone. This project happens to involve food too, so yay for me! I’ll fill the gift sacks with homemade goodies and deliver them to our “adopted college students.” Even if they can’t tell it’s an owl, I’m pretty sure they’ll recognize the Chocolate Chip Brownies inside, right? So here’s what I’m thinking: Crafty or not, you should join me by blessing someone! We have some fun (and easy!) free printables for you, as well as plenty of recipes to choose from. Pick a project or three, get your whole family involved, and love up on the people around you. The best way for your kids to learn to serve others is by serving right along side you! Let’s all do this together. It’ll be fun! 1. Pray with your family about who you would like to bless. 2. Pick your project. Make a craft and/or choose a recipe from our site to make and take to someone. 3. Work on the project together. 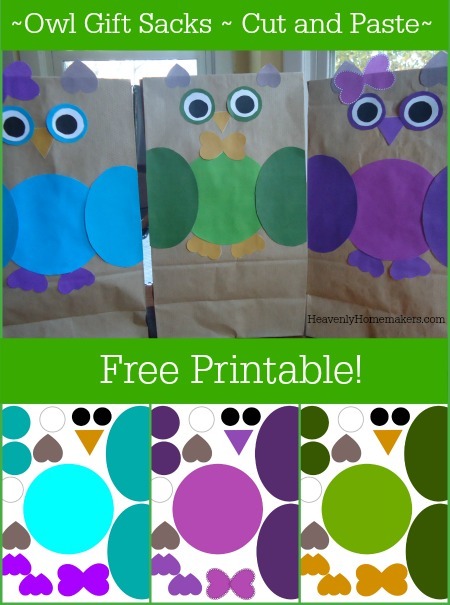 Download the cut-outs for the Owl Gift Sacks here. 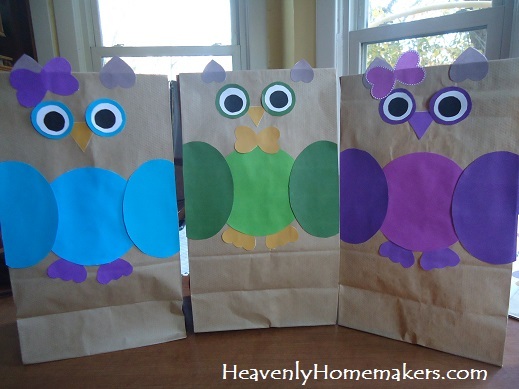 Grab some lunch sacks, scissors, and a glue stick and have fun making your sacks. Fill them with goodies and go bless someone! 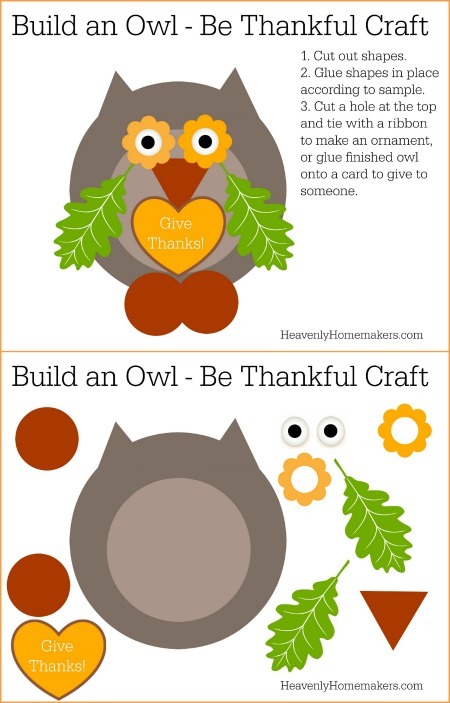 Download your Build-an-Owl Be Thankful Craft. Make it into a card for someone, an ornament for someone, or a treat topper. Bake up some goodies, attach your owl, and make your delivery. Here are some fun sticker labels for delicious fall treats to go with recipes you’ll find here at Heavenly Homemakers. Get the download links and details about these stickers here. Below, you’ll find the links to each Fall Recipe. The possibilities are limitless. Have fun serving with your family! Want more free printables and fun activities to do with your kids? 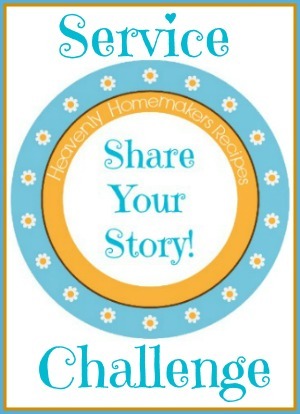 Sign up for the Heavenly Homemaker’s Learning Zone free newsletter. We’ll supply you with fun freebies and share ways you can learn and serve with your family on the cheap! My kiddos are grown so it is just me and hubby. Wednesday of next week is our regular day to make dessert for men’s chapel at the homeless shelter. I do the cooking during the day and hubby delivers it in time for 7 PM chapel. The shelter is in a rough neighborhood where I cannot go alone so we each do our part. We have been doing this for 7 plus years. Super cute craft! I am also commenting for the giveaway- couldn’t find where to do it so doing it here. I really like the giveaway options, particularly the bug stick.